Skin oils have surely got to be one of the best products to incorporate into a skin care routine around this time of year. Every year, without fail, the winter months take their toll on my skin. The cold weather leaves my skin prone to dryness and creates patches of flaky, irritated skin. Not only can this look unsightly, it can also feel itchy and uncomfortable too. When my skin is in this sore state, I need to use highly moisturising yet gentle products. 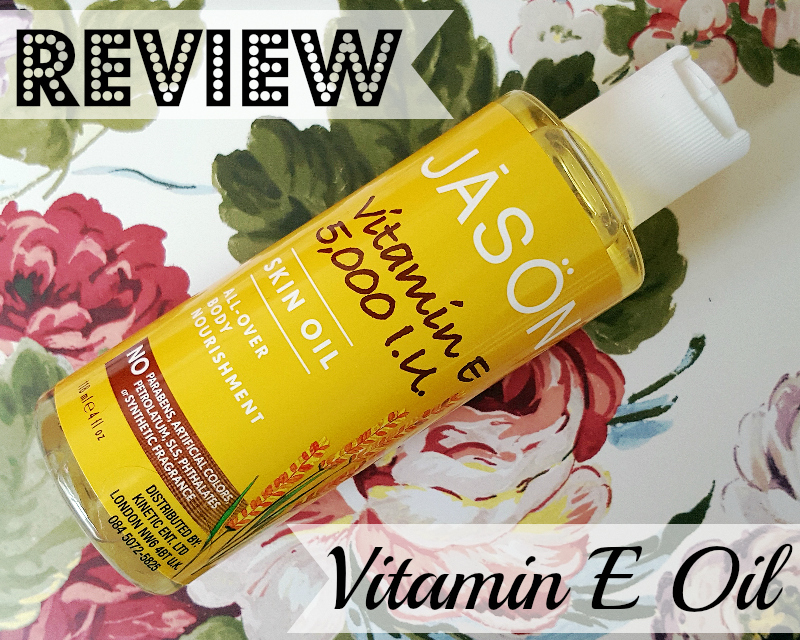 Enter this Vitamin E skin oil from natural beauty brand JĀSÖN which is a product I have been enjoying a lot recently. This oil is actually so much more than just a Vitamin E Oil as it contains a variety of different skin loving oils which I'll talk about later. I've used this oil in a few different ways but I've most regularly used it as an overnight treatment. I've been applying this to my face most nights before bed and by the time I wake up, my skin feels supple and hydrated. It works well alone and when my skin needs an extra moisture hit, I simply apply this oil first and then pop on my regular night moisturiser over the top. I have used this around my eyes too and it's very gentle. This makes a nice eye treatment as the oils keep fine lines plumped out and Vitamin E is a great ingredient for conditioning eyelashes. This is such a versatile product and can be used on your body or hands which is especially great if you have any stubborn dry patches of skin. For intensive all over body care, you can mix this with your usual moisturiser when your skin is in need of more intensive hydration. Even my nails love this oil as they can be prone to dryness around this time of year as well. I absolutely have to mention how good this smells as the sweetness of the almond oil really comes through and reminds me so much of Bakewell tarts and Battenburg cake! I'm really impressed by the lovely ingredients in this product and it is made with a gorgeous array of oils all mixed together including: Sunflower Seed Oil, Safflower Seed Oil, Rice Bran Oil, Sweet Almond Oil, Apricot Kernal Oil, Avocado Oil, Wheat Germ Oil and of course, Vitamin E.
Although this product is made from many different oils, I don't think it's overly greasy and it does absorb into my skin pretty quickly. The packaging is simple yet effective. I'm delighted to see that this product carries the leaping bunny logo meaning it is definitely cruelty free and that is always good to know. This little skin loving Vitamin E oil from JĀSÖN is something that I will continue to reach for regularly, particularly throughout the rest of Winter. I've found that it really does what it claims to do and it's a pleasure to use. Overall, I think that this is a lovely and versatile skin care resource. JĀSÖN Vitamin E 5,000 I.U. Skin Oil (118ml) is available here for £5.69 (Usual Price: £6.89). Have you ever used a skin oil before? All opinions are honest and 100% my own, as ever!